A dangerous invasive weed that can grow to towering heights has turned up in Virginia for the first time. The plant's sap can cause severe burns. WASHINGTON — A dangerous invasive weed that can grow to towering heights has turned up in Virginia for the first time. It’s called giant hogweed for a reason: it can grow 15 feet tall or taller. Metzgar helped confirm the discovery of about 30 plants in Berryville in Clarke County. It appears they were planted as ornamentals by a now-deceased landowner in the 1970s. “The population hasn’t spread at all, so that’s a good thing,” said Metzgar. He said the plan is to dig up and kill the existing plants, and return to the site once or twice a year for the next several years to ensure no more plants have appeared. The giant hogweed is considered an early-detection invasive plant in Virginia because it is not yet established in the commonwealth. The big problem with the weed is that if you get some of its clear sap on your skin on a sunny day, it can cause severe burns if you don’t wash it off. “The sap contains chemicals that are activated by sunlight,” Metzgar said. Metzgar said the plant is so rare in Virginia that you’re much more likely to stumble upon poison ivy. “The first thing to remember is, if you think you see it, you probably haven’t,” he said. The plant has been mistaken for others that look like it such as cow parsnip and Queen Anne’s lace. This printable guide will show you the differences. 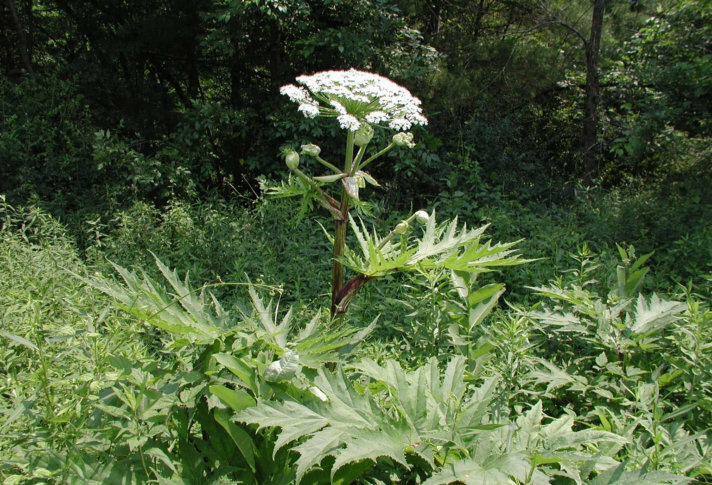 If you suspect you’ve found a giant hogweed, you’re asked to take photos of a leaf, stem and flower and contact your local Virginia Cooperative Extension office, or fill out an online report.